Casa Del Sol is the upstairs portion of A Moab House. 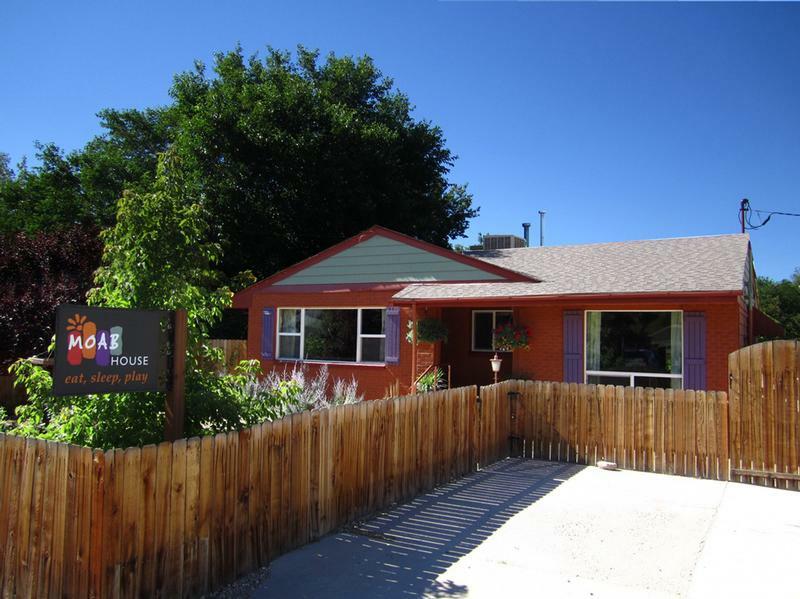 It is a cheery and colorful 3 bedroom, 2 bathroom home that can sleep up to 6 It is , located on secluded and quiet W Center St, but just 1 1/2 blocks from the epicenter of downtown Moab. Casa del Sol is warmly welcoming with very roomy gathering spaces; the fully equiped kitchen is adjacent to both the 3 couch living room and the large sunken dining room with seating for 10. It has 3 private entrances that allow easy access to the large, beautifully landscaped and fully fenced yard plus a covered outdoor BBQ and gathering space with a dining table that seats 10. Amenities include wi-fi, washer/dryer and cable tv. The large backyard has a hot tub, shade trees, covered dining area, wood-burning fire pit, wall-mounted MTB/road bike stand and ample off-street parking. The outdoor amenities will need to be shared if seperate guests rent the downstairs, Casa del Canyon, during your stay.